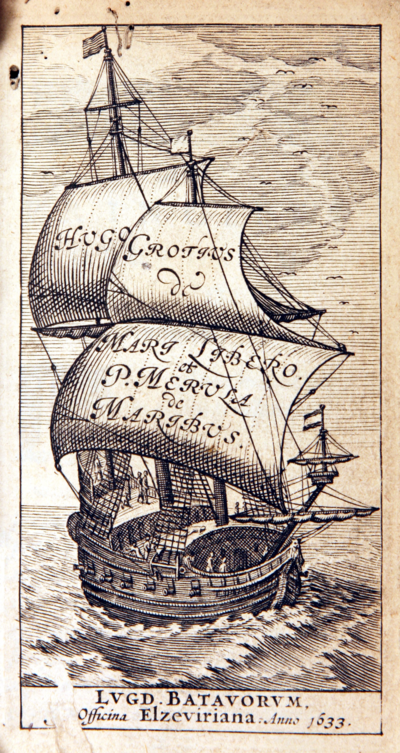 Mare Liberum was first printed in 1609. In it the Dutch jurist and philosopher Hugo Grotius asserted the "freedom of the seas"a new principle that the sea was international territory. [f]ully convinced...that there is a common law among nations, which is valid alike for war and in war, I have had many and weighty reasons for undertaking to write upon this subject. Throughout the Christian world I have observed a lack of restraint in relation to war, such as even barbarous nations should be ashamed of. (Prolegomena, 28). The Library's earliest edition of De Jure Belli ac Pacis is dated 1642.